Here, Edward Ferguson gives us an update on the project he and his family started last year with a consultation at last year’s ask an architect. Following on from our discussions and planning meetings last year with Clyde Markwell, from Knox & Markwell Architects, we arranged for detailed plans to be drawn up and submitted for building control approval. Clyde also drafted the detailed specifications necessary and managed the entire tendering process for us and in due course a contract was agreed with Laird Contracts Ltd, Bangor. As is normal with any project of this nature the predicted costs exceeded our intended total budget so we did have to make some adjustments to our original plans but that process too was expertly handled by Clyde. We were then at the stage of deciding when to actually begin the project and we decided early Autumn would suit us best. 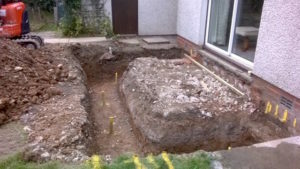 A view of works on the foundations for Edward and his family’s new garden room at their house in Bangor. Photo: Edward Ferguson. As you can imagine, having external and internal building work being done while living in a house can be very challenging. It will certainly be disruptive and a bit disturbing as your home is invaded by people for some period of time. How you cope with this will depend on a number of things not least of which will be the relationship you establish between you and your builder. Certainly the early meeting between Clyde, Jack and Harry from Laird Contracts, and ourselves was useful and reassuring. We were very happy with the way in which each stage of the work was explained and agreed and by the cooperation of all involved in making the process as smooth as possible. Work began on the Ferguson’s house last Autumn. Photo: Edward Ferguson. And so it all began. Mini-diggers and skips and plenty of manual work preparing the ground works and getting the foundations for the extension prepared. On very wet days work began on taking down the dining room partition wall and removing floorboards from the family room and dining room/hall area in preparation for installing underfloor insulation. Eventually the external dining room wall was cut through to allow for the installation of a much larger window. 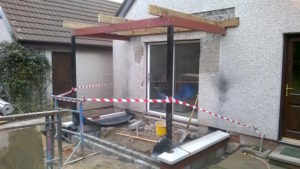 Then the sub floor and the steel framework was built, the Trocal roof prepared and shortly afterwards the double glazed units and sliding door system was installed. A view to the Ferguson’s new dining room. Photo: Edward Ferguson. The finished work has more than exceeded our expectations and is judged by us and our family as a great success. What we hoped to achieve has been achieved. Our ‘new’ dining/hall area has created a real sense of space in the centre of our home. 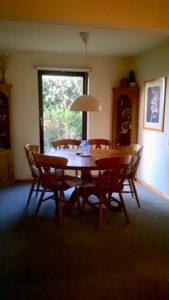 The whole area has benefitted from a significant increase in light from the extended window and the view out to the garden area is an added bonus. The extended family room has a more contemporary feel and is also far more spacious, bright and warm. The large glazed areas allow for a much greater sense of being surrounded by garden and the potential for interesting viewpoints has been fully exploited. 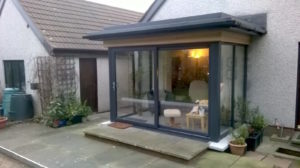 A view of the completed garden room at the Ferguson’s home. Photo: Edward Ferguson. We have nothing but praise for the ‘ask an architect’ scheme. It was the incentive which encouraged us to take the positive first steps in realising our plans to enhance our home and make it more aesthetically pleasing and user friendly. We remain surprised and pleased at how a relatively small scale project has transformed our living space. That is in no small measure down to the vision and practical expertise of Clyde Markwell and the experience and thoroughness of the Laird Contract Ltd team. We thank them all sincerely. Architects Knox and Markwell are taking part in ask in architect 2018 – bookings are open now. 100% of all funds raised by ‘ask an architect’ support cancer research through clinical trials, thanks to your donations and our fantastic sponsors who cover administrative costs and provide critical pro bono services. The clinical trials supported by ask an architect are research studies involving patients. Through clinical trials, doctors can find new ways to treat certain types of cancer, improve existing treatments and improve the quality of life for patients, with the ultimate aim of improving a patient’s outcome.